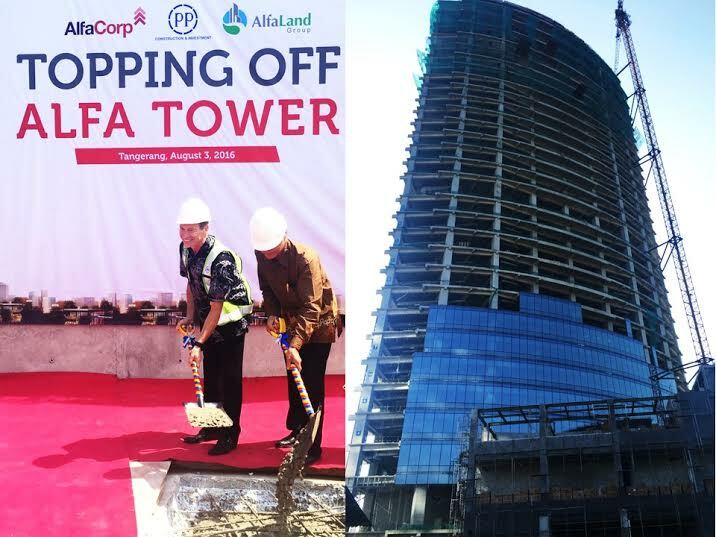 After two years since its groundbreaking, ALFA Corporate Headquarters Tower 1, a 32-storey Green Building was topped-off on the 3rd of August 2016. Mr. Stephen Stinton, PTI Architects' Design Director for Special Projects and Ms. Shakuntala Kartikasari, Associate joined the executives of the ALFA LAND Group and ALFA Corporation to celebrate this occasion, as it marks its place on the skyline of the fast-growing district of Alam Sutera, Tangerang. ALFA Corporate Headquarters was awarded the Five Star Best Commercial High-Rise Architecture in the Asia Pacific Property Awards of 2015-16 due to its meticulously designed functional layout and uniquely curved form that promises to offer high quality office environment with top grade building services and an ESD Gold Rating. Mangkuluhur City, a 280,000 square meter mixed-use complex in the heart of Jakarta's CBD comprising of grade A commercial offices, the 5-star Regent Hotel, two Apartment Towers, the refurbished Crown Plaza Hotel, and a Lifestyle Dining Zone, remains true to its commitment to be one of Jakarta's premium property developments in the coming years. First to be topped-off on the 9th of September 2016 is the 33-storey Office Tower 1. The event was attended by Mr. Harry Gunawan, President Director of PT Kencana Graha Optima (left), Mr. Hutomo Mandala Putra, High Commisioner of PT. 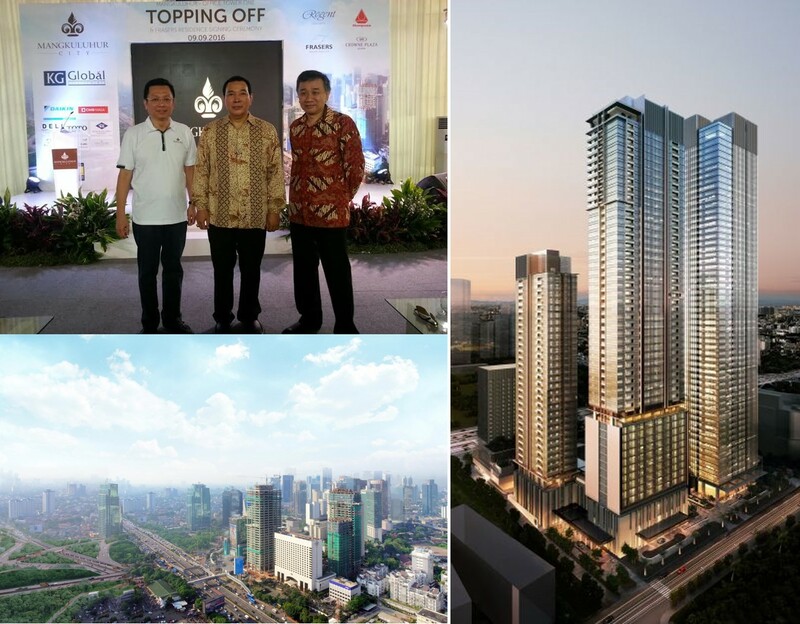 Wisma Purnayudha Putra (middle) and Mr. Doddy Tjahjadi, Managing Director of PTI Architects (right). The said event also marked the signing formalities of Fraser Residences as the operator and PTI Architects as the appointed architect and interior designer of the Serviced Apartments. 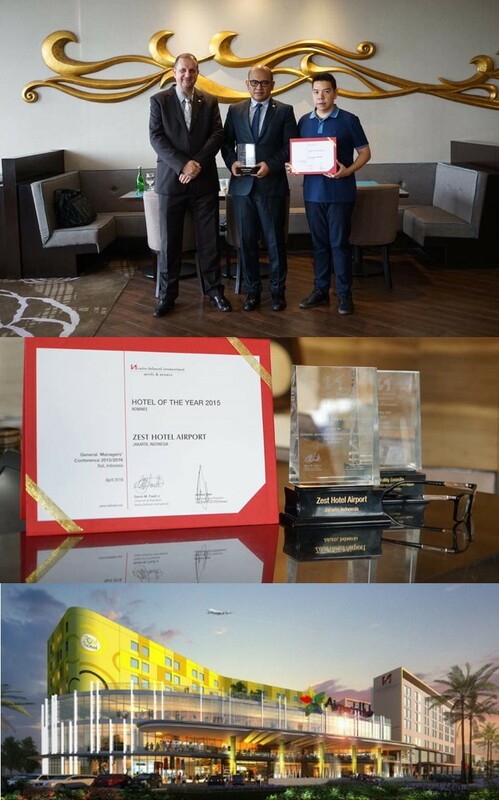 Zest Hotel Airport Jakarta continues to receive awards from the travel and tourism industry. At the recent General Managers Conference held in Bali, Indonesia, Zest Hotel Airport Jakarta was recognized as one of the nominees for the Hotel of the Year 2015-2016 and a winner of the Rev PAR Award for 2015. Barely 2 years in operation and as the first Zest Hotel to be launched under the Swiss-Belhotel International Hotels and Resorts, it leads the way in strengthening the brand known as the Leading Global Hotel Chains in Indonesia for six consecutive years. Proudly receiving the awards are Mr. Emmanuel Guillard (left), Swiss Behlotel International's Senior Vice President of Operations and Development, Mr. Deddy Sasmita (center), the hotel's General Manager and Mr. Heru Gunawan, owner of the hotel. 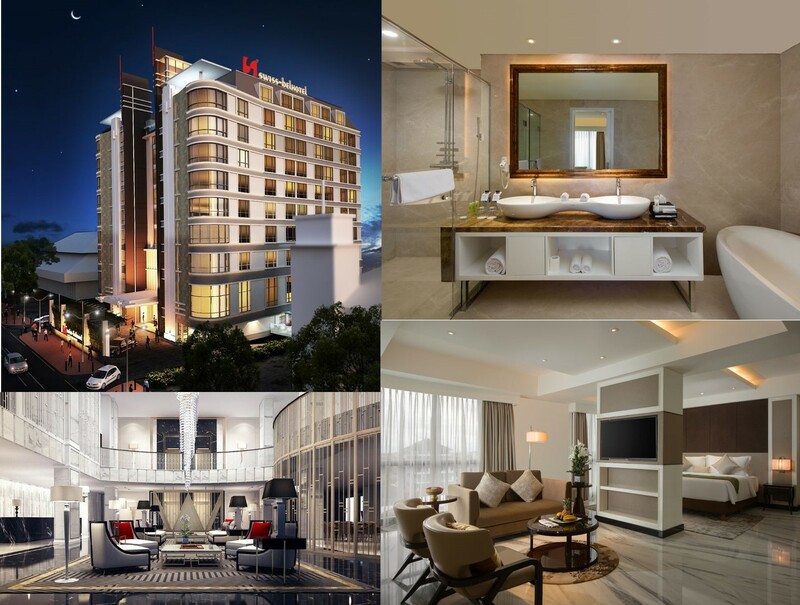 The soft-launch of Swiss Belhotel Yogyakarta is another addition to PTI Architects' portfolio of high-quality and impeccably-designed hospitality interiors. The 4-star brand under Swiss-Belhotel International offers 4 room types: Deluxe, Grand Deluxe, Business Suite and Executive Suite, totaling 121 keys. The interior design theme of the public spaces including the cafe and restaurant, bar, meeting facilities, spa, gym and guest rooms draws inspiration from the art deco style of simple rectilinear and geometric patterns which basically reflects the same theme of the exterior architecture. Its finishes, furniture and furnishings combine a predominantly warm color palette with a splash of deep red, the brand's distinct color. 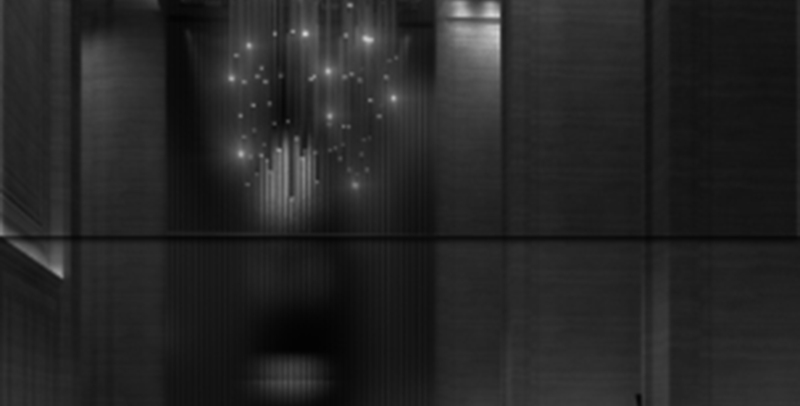 A central feature in its double height lobby is a striking and elegant glass chandelier. The hotel is centrally located within easy access to Malioboro shopping district as well as banking, private & government offices and heritage buildings in central Yogyakarta and will definitely be the preferred choice of both business and leisure travelers. In celebration of the12th Anniversary of Indonesia Design, one of Asia's widely circulated design magazines, PTI Architects' Associate Aditya Wirawan Fitrianto shares a historical account on the Batavia City Walls, what is left of the walls today and its current deplorable conditions. As the origin of the city of Jakarta, he expresses an urgent call for restoration and preservation of the city's heritage for present and future generations of Indonesians and the world to appreciate and to value.